1008 Lingam Shiva temple is very popular Lord Shiv temple in the city Salem. 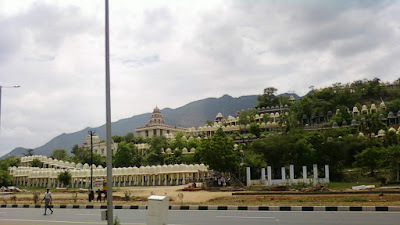 During the official visit to Vinayaka Mission University, I saw this temple. That time I don't know about this temple but when I saw this Shiv temple I decide to visit it and found that it is very popular in the local area and also in the city. This Shiv temple have total 1008 Shiv Lings that why it is also popular as 1008 Lingam temple. You will see in the temple each Shivling with a holy cow Nandi. This Shiv temple looks very beautiful from the road of the national highway. Hindu God Shiva has a thousand names mentioned in the Shiv Sahastranamavali. On the basis of this, this temple has 1008 Shiv Lingam. Each Shiv lingam dedicated to each name of Lord Shiv. There is a huge Shiv Ling about 17-18 feet. 1008 Shiv Lingam temple is actually established on a small hill so you have to go upwards like climbing on this small hill to see the main temple. As you can see the symbol of Vinayaka Mission University there is a Lord Ganesh image is there. So at the starting of 1008 Shiv Lingam temple, there is a huge statue of Lord Ganesha with the temple. In the1008 Lingam Temple, there are various temples of popular Hindu god and goddess some of them are listed below. There are many priests in each temple of 1008 Lingam Shiv temple who follows the daily routine of the religious activities in the temple like worship, Arti, offering food to God etc. Temple is very good decorated during any Hindu festivals like Mahashivratri, Hanuman Jayanti etc. Various function and activities also organized in this temple. 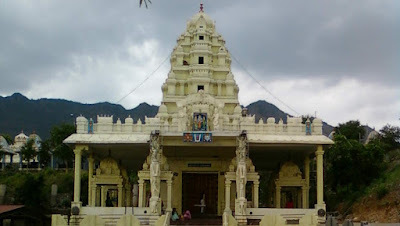 After entering this temple you feel divine and get blessed by various gods in the temple. At the time when I visited there is not so much crowd. So I visited the temple very easily and visited everywhere in the temple. It was a very good coincident when I visited this temple that time this temple building construction was undergoing. I visited this Shiv temple in the 2010 year end. After that, I did not get a chance to visit this temple again. This temple construction was done by the Vinayaka Mission University. 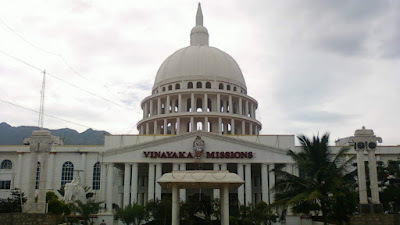 It is not a commercial temple it is run under the Vinayaka Mission University. There is a separate department in the Vinayaka Mission University who deal the management and maintenance of the 1008 Lingam temple. I did not hear any mythological story about this temple so I can't say it is a very old or historical temple. Temple is opened at 08:00 am in the morning and closed at 08:00 pm. So you can easily visit the temple any time and get blessed by Lord Shiva. If you want to see the full temple then maximum time will be for this temple is 2-3 hours. For visiting a temple any time is the best time but we keep in mind many things before visiting a place so if you plan to go to Salem city then the best time to visit Salem city is October to February. For any temple, the best time to visit is the morning time so you will prefer the morning time to visit this Shiv temple of Salem. In the afternoon the Salem city temperature goes high. You can also visit the temple in the evening but the morning will be best as per my point of view. There are no entry fees in the temple for entry. Normally there is no entry fee for any Hindu temples. Shiv temple is well maintained by the Vinayaka Mission University. Temple is clean and all basic facilities are available in the temple. There is no parking stand for parking two and four wheelers. But you can park your vehicle in an open space near the temple on your risk. Washroom facility is there and in good condition. There are food stalls in front of the temple where you can take snacks and lunch also. There is no shoes or slipper stand so you have to keep with you until you reach the main temple. There is a drinking water facility but not much. So keep water with you. There is a small shop of Prasad where you can purchase normal worship items. But you want to offer more things then you have not much choice to offer many things in the temple. The 1008 Lingam Shiv Temple is situated in the suburban area of the Salem city Ariyanoor. It is approximately 13 km from the main city. 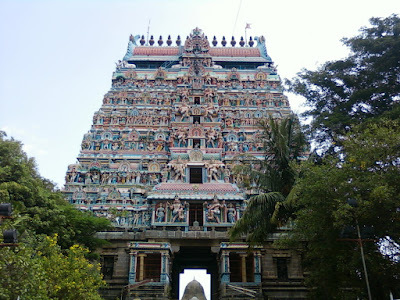 1008 Shiv temple is very popular in Salem so if asked for anyone about the temple then local peoples easily guide you. 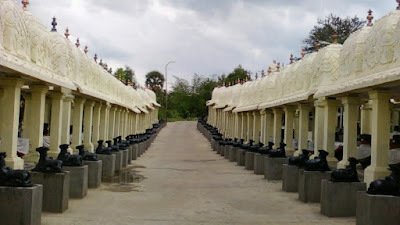 1008 Lingam temple is situated near the Vinayaka Mission University on National Highway 47. 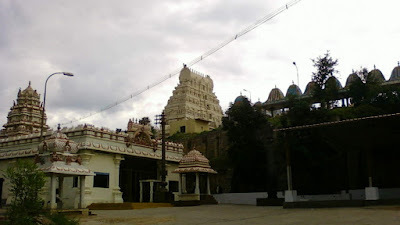 Due to Vinayaka Mission University, this place is well connected to the main city so you can easily get the Auto, taxi or cab for here. From the main city here is city bus service which can drop you at the main gate of Vinayaka Mission University. I was reached to Vinayaka Mission University by bus and then visited this beautiful 1008 Shiv Lingam temple in the year 2010. I will recommend if you go to Salem then you can visit this 1008 Shiva Temple Salem. It is a good place for one time visit. Tamilnadu is a very hot state then you can avoid the summer season and you can choose October to February month for visiting the Salem city tourist places. Photography is allowed in outside the main temple. I will recommend visiting Salem city in February or March (Masi month of Tamilnadu). In Salem city, they celebrate their annual function on full moon day every year.